The dining room was designed by Red Hook-based firm UHURU. After 14 years and one Michelin star in Brooklyn’s Boerum Hill neighborhood, chef Saul Bolton decided to pack up lock, stock, and barrel last year and move into an 87-seat space tucked away deep inside the Brooklyn Museum. And while the food Bolton is serving there hasn’t skipped a beat from his earlier days, the space is a difficult one to feel comfortable in. We had the opportunity to dine there at the invitation of the restaurant recently, and left satisfied but conflicted. First, the food. Cured Atlantic mackerel with ponzu, mushrooms, and puffed rice was artfully executed and fun to eat. A salad of cooked and raw fennel with citrus, olives, and endive jumped off the plate with well-rounded acidity. Parsnip soup was elevated by a hit of cocoa, and wild striped bass was perfectly seared and crispy-skinned. 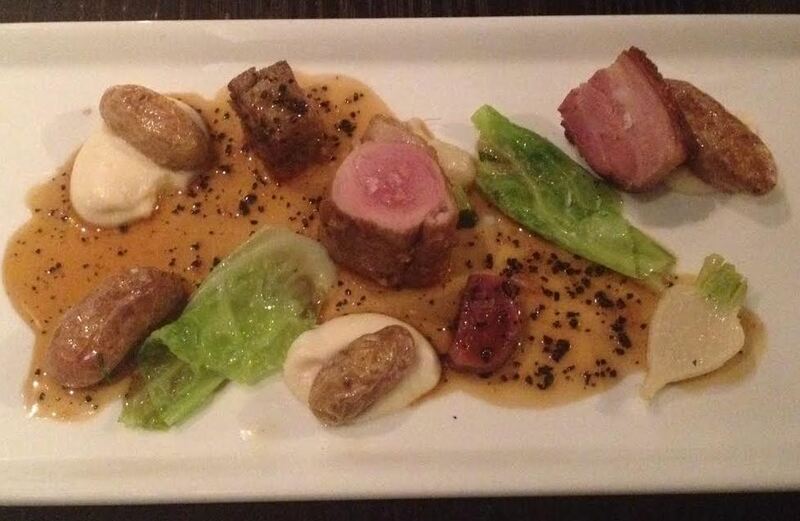 The main dish, Vermont pork with turnips, potatoes, and mustard (below), showcased the loin, belly, shoulder, and kidney. While the loin was a bit undercooked and the addition of the oddly crunchy kidney served more as a challenge to the diner than a complement to the dish, it overall allowed the high quality of the pig to shine, and it was a joy to work my way around the plate. Now, the space. In order to access the restaurant, you enter through the front door of the museum, tell the guards that you’re there for the restaurant, then follow their directions to a guarded door in the corner past the admissions kiosks. Once granted access, you walk down a hallway before turning left through the main entrance to the restaurant. The space itself is low-ceilinged and predominantly wood, with natural wood floors and black wooden tables and chairs. Murals by Paul Kelpe decorate the walls, and the bar area feels like it’s in a dark corner. One wall is made of glass and lets you peer into the exhibit next-door, but you don’t ever get the feeling that you’re eating in a museum, for some reason; it just feels like you’re eating in a smallish room inside a much larger building, if that makes any sense. After spending an afternoon walking around the Brooklyn Museum, finishing it off with a meal at Saul is possibly an inviting option, but it seems to me like many visitors would instead prefer to get back out into the adjacent picturesque neighborhoods of Park Slope and Prospect Heights, both brimming with stellar restaurants, and take their pick among those. On the other end of the spectrum, I’m not sure that people who live in either of those neighborhoods would venture all the way up to the museum not to look at art, but to instead eat an $85 tasting menu. Similar concepts, like Danny Meyer’s The Modern, work well because it’s both a destination unto itself and a natural extension of its home museum. Saul doesn’t feel like either of those things. While the food served at Saul is every bit as good as it was at the restaurant’s previous incarnation, the restaurant just doesn’t feel quite at home inside the museum. It’s not very easy to locate, and I’m not sold on the idea that it’s a natural place for museum guests to visit. Bolton took a huge gamble by moving his operation into the museum, securing a spot at the vanguard of opening high-end restaurants inside high-profile museums. And while Saul very well might be one of the best museum-based restaurants in the country, it’s a gamble I’m not sure will pay off.